The Vietnamese authorities have confirmed that more than 700 endangered moon bears held in captivity have died in the last year. Figures released this week by the Ministry of Agriculture and Rural Development (MARD) show that 1,245 bears remain in captivity, down from 1,987 in 2014. The number of deaths has been attributed to old age by the authorities. However, Animals Asia believes there is also significant numbers of bears dying due to other causes. For every captive bear that dies, the authorities are required to carry out an autopsy to confirm the cause of death and to oversee the disposal and burial of the corpse to prevent body parts being illegally sold on the black market. It remains unclear whether such protocol has been followed for the 742 bears who have died since the last official numbers were released. It follows the high profile situation in Halong Bay where 49 bears, whose malnutrition and lack of care was highlighted by Animals Asia in November 2014, have seen their numbers drop to 19. "These numbers suggest that what we've seen happening in Halong Bay, where farmers have publicly confessed that their bears are starving to death, could be happening on a vast scale. Most worryingly, we have received unconfirmed report that bears are being deliberately killed and their body parts sold on the black market as bear farmers look for ways to recoup as much as they can from the bears. "We're dealing here with the fallout from the end of the bear bile industry in Vietnam and only the government has the power to decide how the industry will end. "Animals Asia is calling on the authorities to ensure that bear bile farming ends as humanely as possible. Where there are sanctuaries and rescue centres, rescues should be encouraged. Beyond that, farmers are supposed to be caretakers of these bears - selling the bear alive or dead is a criminal offence as is failing to provide a proper level of care." "Vietnam is on the verge of ending bear bile farming. The market has crashed and awareness over the cruelty involved has made bile a product that most people no longer want to buy. For partnering with us and allowing us to rescue bears and raise awareness - the government deserves credit. Now they must finish this task as humanely and responsibly as possible." 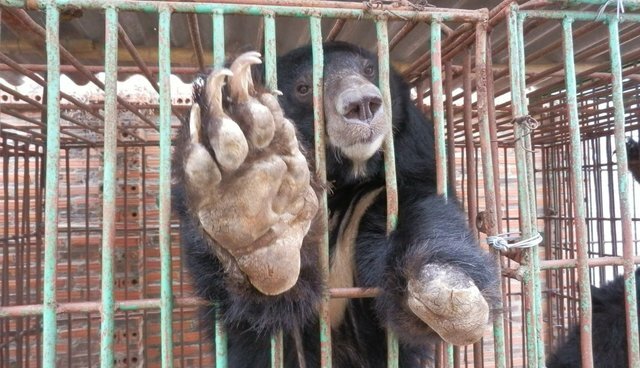 Bear bile farming has been illegal in Vietnam since 1992. In 2005, the 4,239 bears held in captivity were microchipped and farmers allowed to keep the bears on the understanding that they would never again extract bile. In 2012, 2,400 bears were officially being held on farms before the number dropped to 1,987 in 2014. Animals Asia is currently urging the government to allow the rescue of the remaining 19 captive bears in the Halong Bay region. Despite campaigning since January and the collection of over 100,000 signatures urging action, the authorities are yet to give Animals Asia a mandate to rescue the bears.